"I often wonder what the other side of the picture of haunting is in Ghost Land? Is it the dead alone that can disturb the living, or can the living similarly disturb the dead? " If you are interested in the paranormal, it is quite likely that you have heard several stories regarding haunted land. There are many real life ghost stories, scary ghost video clips, and real photographs of ghosts that have been taken throughout the world. Many of these stories and evidence sources are directly pertaining to a particular section of land and/or occur on a certain area of land. Ghost investigators that have a true passion for establishing proof of ghosts often spend countless nights on these pieces of lands. Many mysteries surround these sources of paranormal activity. In this section of Greatest Unsolved Mysteries, you will quickly discover many interesting facts pertaining to various types of properties that are believed to be haunted. The first and one of the most common types of haunted lands include battlegrounds. There are many battlegrounds located throughout the world today. Many individuals refer to these as “battlefields”. Regardless of what they have, the emotion and tragedy that has occurred on these lands has seemingly increased the amount of unusual phenomenon and basic ghostly experiences on the plots of land. In the United States, some of the most popular battlefields include that of Pearl Harbor and Bunker Hill. 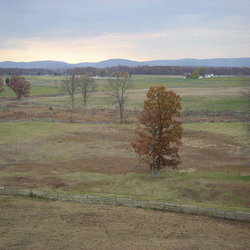 Gettysburg is also a very popular section of land where many individuals lived, fought, and tragically died. The next most common types of haunted lands found in the world are graveyards and cemeteries. While these types of lands are designed to place the deceased at rest, many spirits are more active than they ever were when they were among the living. Not only are the deceased present on these grounds, other entities are believed to haunt these types of lands as well. There are stories of voodoo queens, poltergeists, demons, and even ghostly animals circulating the globe in today’s world. This is especially true since television is now covered in shows pertaining to the paranormal and ghost hunting in general. Throughout this section of Greatest Unsolved Mysteries, you will learn many ghost facts surrounding the haunted lands throughout the world. The ancient Black Hope Curse is said to plague the land that is located just outside the city of Houston in the State of Texas. The Gettysburg Ghosts have made their presence known time and time again to the many visitors of the area. The Skinwalker Ranch seems to hold many secrets – most of which pertain to the signs of paranormal activity that have abounded there for decades.